I'm in Pokhara, Nepal and preparing to leave tomorrow to trek the mighty Annapurna Circuit. I'm absolutely loving it here. It's so peaceful here and the setting beside the lake with the Himalayas in the background is simply beautiful. Well, okay...I haven't actually seen the Himalayas yet because it's been so cloudy (in fact it's raining as I'm writing this) but the pictures I've seen look stunning. I hope I'll get to see it like this when I return next month. It's wonderful to escape the noise, pollution and constant attention that I've had so far in the big cities. Because it's just the beginning of the trekking season there aren't a lot of tourists here yet. But, for a few reasons I'm very glad to be here and starting my trek at this time. Firstly, the weather (once I get out of Pokhara I've been told) will be perfect for trekking. 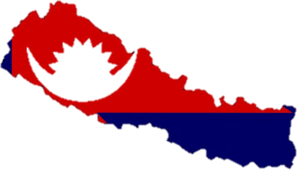 Secondly, this is the first time in over a decade that Nepal is in relative peace and stability. Finally, there is a new rule coming into effect very soon that states that every trekker must have a guide or porter. Fortunately, right now I still have the freedom of choice. I'm getting used to Nepalese bus travel after a seven hour trip across from Kathmandu. I wondered as I waited for the bus that morning whether Friday the 13th was the best day to be taking such a journey. I wondered just a little more when we passed a point where another bus had left the road and plunged into the river bed below… Fortunately we were fine in our 'tourist' bus (the 'local' buses are often poorly maintained) and I had relative comfort compared to other trips. Nepal is a wonderfully cheap place to travel in. My accommodation for example costs me $3 AUD per night. Okay, I'm sharing with a friend I met on the bus but it's a very nice place and we have our own ensuite bathroom with hot water and even toilet paper. (Don't take anything for granted in this part of the world) Going for a meal costs about 3-4 dollars and now I'm over the Delhi Belly I'm starting to enjoy the local cuisine again. Today I walked around the lake and hiked up to a stupa (Buddhist temple) on the far side. Only 90 minutes each way but a good hint of what the next three weeks will be like. Tomorrow I'll be on a bus to Besishahar. I'll be hiking the circuit around as far as Ghorepani which will take me over the Thorung-La Pass which is 5,416m. Instead of continuing through to Birethanti I'll cut across into the Annapurna Sanctuary and hike up to the Annapurna Base Camp. From there I'll come back down the valley and finish at Phedi, which is only a short taxi ride back to Pokhara. Altogether, my health and God willing it should take me about 21 days.